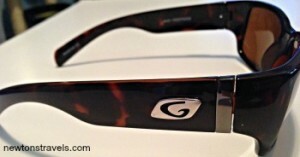 I had the opportunity to review a pair of sport sunglasses from Guideline Eyegear. The 2014 models are eco-friendly and you can find a nice variety of sunglasses at their website http://glpolarized.com/. In addition to the pair I received (see review below), I love the Alpine and Keel styles too. Their sunglasses are really great for snowboarding, fishing, skiing and other fun outdoor activities. They are made with polycarbonate laminate lens construction and also have a scratch resistant coating which is something very important to me. I’m always scratching the lenses of my sunglasses. 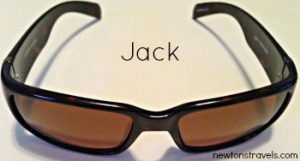 The company sent me the Jack sunglasses to review. These are made for the active woman who is a true adventurer. It features a square classic design with over sized temples for a comfy fit. They look sharp! I always struggle to find a real good pair of sunglasses that fit well and these definitely do. I took them on my recent trips to Atlanta and Indiana and these helped with the brightness and reflection from the snow and ice. They were especially helpful when I had to drive back from Indiana in the sun. There was no glare and totally prevented any eyestrain (can you say headaches?) which I normally get with my cheap Walmart sunglasses. They are going to be a great addition on our vacation to Roatan, Honduras too. They have another cool style called the Captain, a wire-hinged aviator style good for both on and off water and comes polarized with slight lens curvature designed for performance. The Captain sport sunglasses look snazzy too. Most models are under $80! Totally affordable for a really good pair of sunglasses. Sometimes you just need to spend more to get a good product. And they come with a soft and light weight case with velcro closure. You can find GuideLine Eyegear on Facebook. And they are on Twitter too. Be sure to go check out their great line of adventure/sport sunglasses. They make perfect gifts for travelers.